due to their grace, matching their opinions of its meanings, through creation of vyAkyAnams for thiruvAimozhi which is the essence of dhivya prabandhams, those who protected it are piLLAn et al, says maNavALa mAmunigaL, starting this pAsuram with ‘piLLAn’. 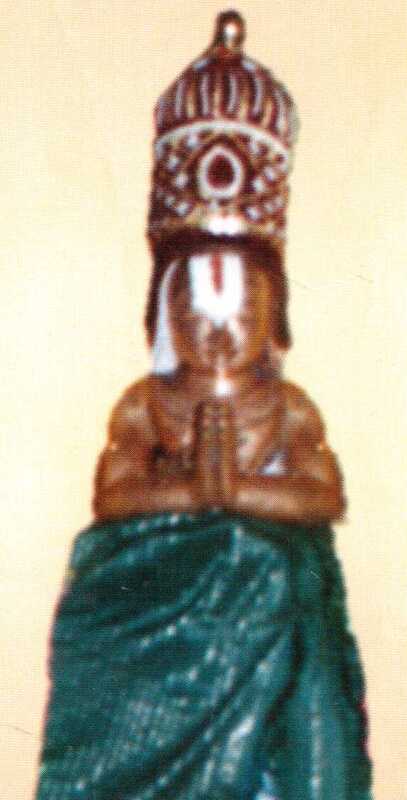 piLLAn – he is: As emperumAnAr was thankful to thirukkOshtiyUr nambi for his great mercy, he gave nambi’s name (kurugEsar / thirukkurugaip pirAn) to his sishya as thirukkurugaip pirAn piLLAn, whom he considered as his son; such is this person who has the greatness of having the name of nambi, and because of that, he was being important than others for him (emperumAnAr), and learned from him (emperumAnAr) all inner meanings of vEdhAntham, and was knowledgeable in all sAsthras, and grew thamizh and samskrutha vEdhanthams as ubhaya vEdhAntha pravarththakar (one who enriches/spreads it). 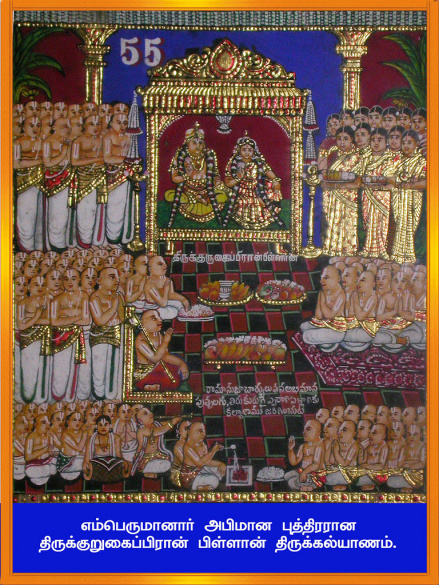 nanjIyar – he is: loved as ‘nammudaiya jIyar’ (our jIyar) by the divine son of fully knowledgeable kUraththAzhvAn, that is bhattar who knows all the SAsthrams; and (nanjIyar) learned all the meanings in the sannidhi (presence) of bhattar, without any doubt or confusion, and after that explained thiruvAimozhi a hundred times and due to that had the sadhAbhishEkam (honour of completing a hundred). periyavAchchAn piLLAi – he is – surrendered to the divine feet of nampiLLai who is like the incarnation of AzhvAr, and for avoiding the hurdles for any kainkaryams to his AchAryan he had left all the other goals/achievements along with any trace, and learned and heard all the meanings clearly in his AchAryan’s sannidhi, and being liked very much by his AchAryan. 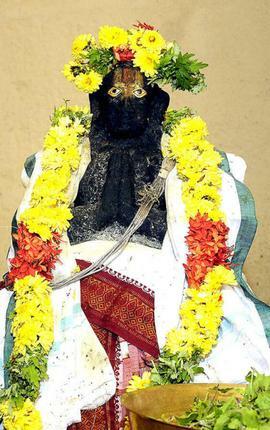 theLLAr vadakkuth thiruveedhip piLLai – Having such great clarity in spreading the meanings of thiruvAimozhi, and due that, earning the phrase of ‘sakrushNa dhvayau [thiruvAimozhi bhagavath vishaya thaniyan]’ (nampiLLai having vadakkuth thiruveedhip piLLai and periyavAchchAn piLLai), and being talked together with periyavAchchAn piLLai for doing personal kainkaryams to nampiLLai, excelling as per precept, and being abhimAna nishtAgragaNyar (one of the leading in loving (the AchAryan)). 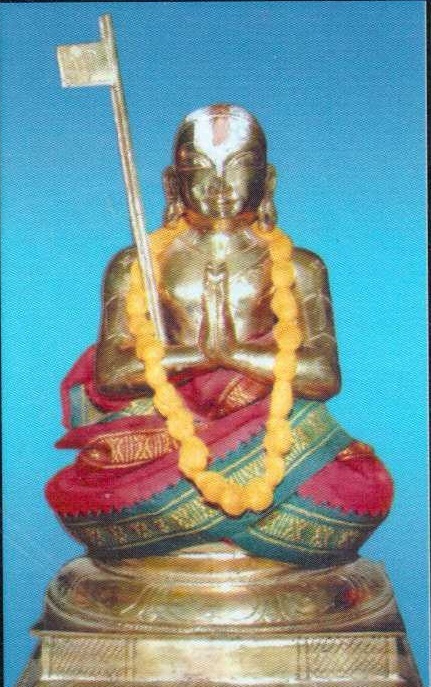 maNavALa yOgi – he is – To be said as ‘abhayapradharAja puthrar’, he fully reached the divine feet of periyavAchchAn piLLai ‘s divine son nayanArAchchAn piLLai, and learned the full and inner meanings of sampradhAyam, rahasyams, and dhivya prabandhams from his teachings, and also learned all the SAsthrams as part of these, and being able to win over other philosophies, and having the talent of speech as can be said as ‘vAdhi kEsari’. That is, vAdhikEsari azhagiya maNavALa jIyar. thiruvAimozhiyaik kAththa – that is, having the great quality of protecting well by doing their individual vyAkyAnams for thiruvAimozhi which is the best in pramANams (references/base) – protecting it from those having less knowledge. They authored the vyAkyAnams starting from ArAyirappadi (vyAkyAnam having the length of 6,000 groups of words), and ending in panneerAyirappadi (12,000 groups of words), and this is explained by him (maNavALa mAmunigaL) himself clearly in later pAsurams. kAththa gunavALar enRu nenjE kURu – Oh the mind which is prostrating the qualities of such people who are having the quality of protecting it through the greatness of their vyAkyAnams. As an outlet of your happiness for their vyAkyAnams, always say about their qualities like said in ‘thadhvAchAvadhathi [thaiththiriyam AraNyakam 1.23] (he is saying that by his mouth). Other parts of us are the pathway for the mind. According to that, he is saying ‘kURu’ (say it). This entry was posted in Other, upadhESa raththina mAlai and tagged 12000, 24000, 36000, 6000, 74, 9000, annan, emperumanar, erumbi, erumbiappa, kesari, kovil, mamunigal, manavala, nanjiyar, pasurams, periyavachan, pillai, pillan, ramanujar, rathina, rathinamalai, raththina, raththinamalai, thiruvaimozhi, tiruvaimoli, tiruvoimoli, upadesa, upadhesa, vadhi, yodi on January 10, 2016 by raghuram.